One of my hobbies is retro video games and tonight’s opening ceremony for the 2012 Olympics inspired me to take a look at Olympic video games over my lifetime. Where games were released on multiple platforms I’ve simply chosen the one that was most relevant to me. One of my abiding memories of the early 80s was spending Sunday afternoons in the children’s room of our village’s local pub. This particular village pub was a geek child’s paradise as the kids room included up to 3 arcade games at any one time. My brother and I would be given 20p each to play on these games, a sum of money that would be expected to last us at least an hour, while dad enjoyed a quiet pint in the bar. I remember Konami’s Hyper Sports very clearly and the youtube above brings back a flood of memories for me. Hyper Sports was released in time for the 1984 Los Angeles Olympics and was the sequel to Konami’s superb Track and Field. If you had walked into any UK primary school in the early 80s you’d have found a BBC Micro, an 8 bit computer developed by Acorn Computers (the guys who went on to develop the ARM processor used in the vast majority of mobile devices). My primary school had exactly one of these high powered beasts and each pupil only got a few minutes on it a month on average. I remember that my dad had a chat with the head master though and scored me a lot of extra time on it. As long as I didn’t make any noise whatsoever, I could use the computer just outside the headmasters office for an hour after school and I used the time to work through my collection of Marshall Cavendish Input magazines. Happy days. The BBC wasn’t known for its games however. Micro Olympics was rubbish! Ahhh the humble speccy— Oh how I loved thee! The spectrum was my first ‘proper’ computer and I received it for my 8th birthday. All I wanted to do was play games but my father insisted that I also learn how to program it and so I probably owe my career to dear old dad and Sinclair’s 48K wonder. Released in time for the 1988 Seoul Olympics, Daley Thompson’s Olympic Challenge was a joystick waggler pure and simple. 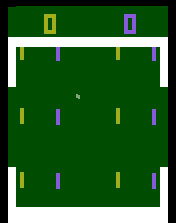 The game included several events: 100 metres, Long Jump, Shot Putt, High Jump and 400 metres, 110 metres Hurdles, Discus, Pole Vault, Javelin and 1500 metres but gameplay consisted of nothing more than frantically waggling your joystick side to side and occasionally pressing the fire button. I remember reading articles that previewed Sega’s megadrive. Back then its power seemed nothing short of astonishing but, sadly, I didn’t have one. One of my friends, however, did have one and many a happy hour was spent over at his house playing Mortal Kombat and Sonic the Hedgehog. Olympic gold was the first officially licensed Olympic video game and was released in time for the Barcelona Olympics. Although the graphics are much better than older games, the game mechanic is essentially exactly the same, mash buttons as fast as you can. By the time the 1996 Atlanta games came around, I had better things to do than play video games. That summer was my last before starting my undergraduate studies in theoretical physics. Many Olympic video games have since been released of course but I haven’t played them and neither do I want to. So, I’ll hand over to The Complete History of Official Olympic Video Games which picks up where I left off. 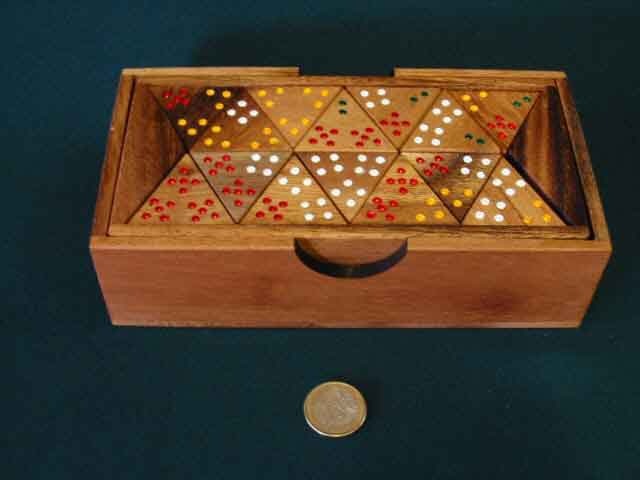 While tidying up the attic the other day I came across a very nice looking wooden set of tri-Dominos that someone had given me as a Christmas gift many years ago. I have no idea where it came from but it looks identical to the set below. I enjoy playing traditional board games whenever I have the time and so my wife and I took a quick look at the instructions and played a couple of games. It turned out to be good fun – much more interesting than traditional Dominos which we also play from time to time. The scoring involves a reasonable amount of simple arithmetic so if you have a child and want to get them to practise addition by stealth then it might be worth buying a set. Amazon sell a Tri-ominos set (pictured below) that isn’t as nice as the wooden set I have but it’s quite cheap and probably worth buying if you’re curious. Let me know if you’ve played and enjoyed this game. 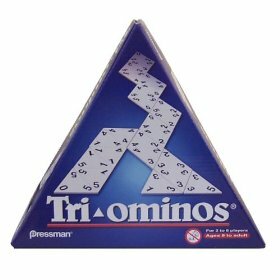 Finally, does anyone know of any computer implementations of tri-ominos in any format (Windows, Linux, Android, Windows Mobile, iPhone..whatever) – I couldn’t find one at the time of writing. I have a playstation portable but I really wish I had a Nintendo DS – take a look at this piece of freeware! One of the great things about the Wolfram Demonstrations Project is the fact that source code is included. This means that it is straightforward to take someone else’s code, learn how it works and then maybe tweak it to suit yourself. 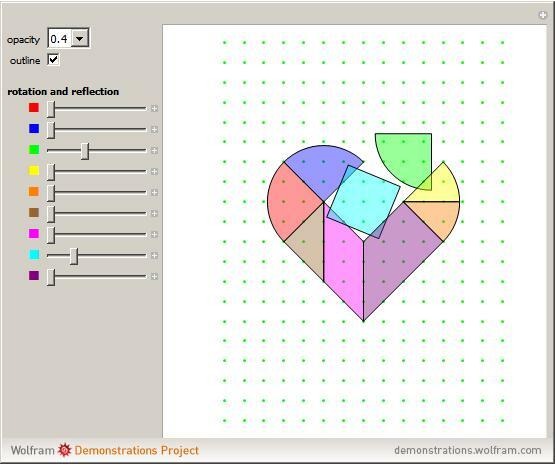 Back in February I did exactly that and used the code in Enrique Zeleny‘s Tangram puzzle as the basis for my own Valentine’s day version – The Broken Heart Tangram puzzle. Things move on though and another demonstrations author, Karl Scherer has produced his own versions of both the Broken Heart and the Traditional tangram puzzles. Karl’s versions are faster, sleeker and generally more fun to use. As an added bonus I get to look at the source code to see how he did it – everyone’s a winner! Lemmings is one of those video games that is so popular that almost everyone has heard of it. Released back in 1991 it has been around for over half of my life and forms an integral part of my youthful memories. In my early high school years I would go to my rich friend’s house and play Lemmings on their Amiga. Back at home, my brother and I would while away the hours playing it on our own, much less powerful and more humble, ZX Spectrum. A couple of years later – while doing my A-Levels and during my first year of University – I would play Lemmings on my Acorn Archimedes before finally graduating to the DOS version on my 233MhZ PC around the time of my undergraduate finals. During the PhD years I played Lemmings on several different systems that came my way (thanks to donations from friends and, of course, ebay) such as the Sega Master System, Sega Saturn and Sega Game Gear. These days I tend to play it on my Playstation Portable. I have played Lemmings alone and with friends, I have played it on the plane, the train and while I should be doing more important things (such as my PhD thesis). 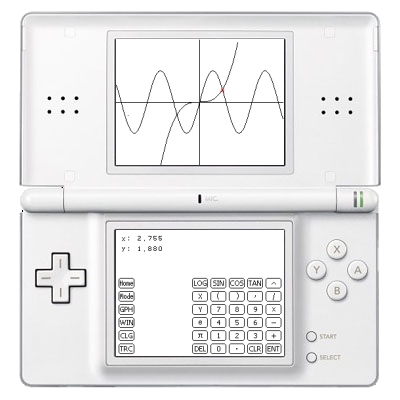 I have played it on computers, games consoles, calculators and palm pilots. Where ever I go – Lemmings seems to follow. Recently though something was missing in my life, I had a Windows Mobile based phone but no Lemmings. Disaster! Fortunately, Johannes Zeppenfeld has come to my rescue with a Windows Mobile clone of Lemmings that seems to work absolutely perfectly and, what’s more, it’s free! You need a file (main.dat) from the original DOS version of Lemmings in order to play this version (no…I won’t give you the file so don’t ask) but, once you have it, installation is a snap! Johannes left this file out to try and avoid possible copyright issues and I can’t say I blame him. I am loving this version – it is practically flawless. Thanks Johannes – you’re a star! Puzzle: Express 2008 with a minimal number of just one digit. At the beginning of the year I wondered what interesting facts I could discover about the number 2008 and, with the help of readers of this blog, I came up with a lot more than I expected to. Now that we are over half way through the year I thought it was time to take another look at the integer 2008 with the following puzzle. Choose any one of the digits from 0 to 9 and attempt to express the number 2008 using only that digit. You can repeat your digit as often as you like and use any of functions that are built into something like Mathematica, MATLAB or SAGE but, as you may expect, kudos will be awarded for using only simple functions and small numbers of repeats. but I am sure you can do better – those ceiling functions are pretty ugly for a start. Feel free to post your solutions in the comments section – I look forward to seeing them. Almost immediately after posting about Crayon Physics and its Clones I had a message from a friend of mine who said “Crayon Physics is very cool!” – how right he was. Not long afterwards he sent another message “Check out Magic Pen” – so I did! 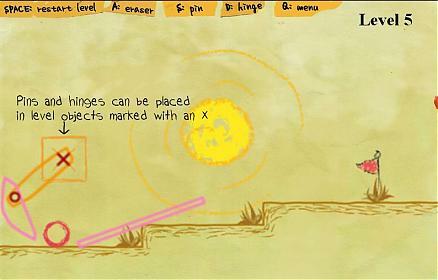 Magic Pen is a flash based game by Alejandro Guillen that is unashamedly a rip-off of inspired by Crayon Physics – the freeware physics-based game that has been a runaway success for its author, Petri Purho. They say that imitation is the best form of flattery and, looking at Magic Pen, Petri should be very flattered indeed. I have already written quite a lot about this sort of game so I won’t go into details about the game mechanics – referring you instead to my original article. In some ways, Magic Pen surpasses Crayon Physics because it is a bit more flexible. For example, in Crayon Physics you can only draw blocks, but in Magic Pen you can also draw perfect circles and, additionally, produce more complicated structures with pins and hinges in them. All in all its a great game that kept me happy for an hour or so but somehow it just doesn’t have quite the same charm as the original. This is not a major downfall though because the original has LOT of charm. Like many people, I am really waiting for Petri to release his sequel – Crayon Physics Deluxe – but in the meantime Magic Pen will do nicely.